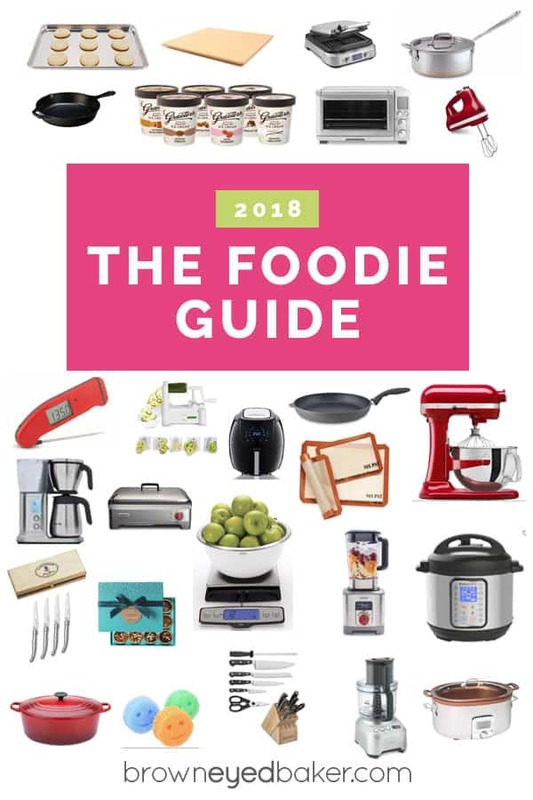 If the person you’re shopping for loves to cook or bake, you’ll find something perfect for them in this holiday gift guide for foodies. A collection of some of my favorite items and those that deserve a spot in the kitchen of every home cook or baker, there is a wide variety of items at many different price points. We haven’t hit Thanksgiving yet, but Black Friday is just over a week away, and maybe you’re already starting to think about your holiday shopping? I will (embarrassingly) admit that I keep a spreadsheet for Christmas and track what we’ve bought people each year, and keep a running list of ideas. Some years I am woefully behind on everything, and others I feel seriously ahead of the game. 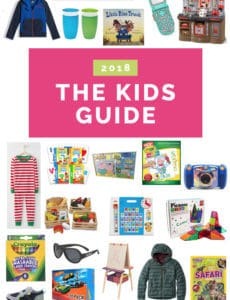 I’m smack dab in the middle this year; I haven’t bought anything yet, but have some solid ideas. Where are you at in the process? 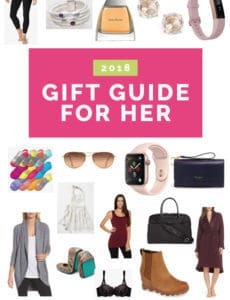 I’ll be sharing some different gift guides over the next couple of weeks, but I thought it fitting to kick them off with my foodie gift guide! If you need a present for someone who loves to cook or bake, you’ll find lots of great ideas here at a variety of price points. Happy browsing and good luck shopping! Vollrath Half Sheet Pans – These may not be the flashiest of gifts, but they are an absolute staple! I’ve had non-stick ones, thin ones that warp, stone ones, and these Vollrath aluminum are the best I’ve ever used. I have four in my kitchen and am actually thinking of getting a couple more. Bonus! The Silpats (see below) and my favorite wire cooling racks fit perfectly inside! Baking Stone – I have owned this baking stone for nearly 10 years and it’s perfect for making pizzas and breads – they bake up with perfectly crisp crusts. If you like homemade pizza, a pizza stone is a must! Breville Waffle Maker – Another small appliance that I’ve owned for quite a long time and absolutely LOVE. I make waffles less often than I make pancakes, but this makes the absolute BEST waffles! I used to have one of those round Belgian waffle makers that you flip upside down, and this one beats it, hands-down. All-Clad Saucepans – Towards the end of last year, I upgraded my old saucepans and bought new 2-quart and 4-quart saucepans, and have been absolutely smitten. They heat so evenly and clean up wonderfully! Lodge Cast Iron Skillets – I don’t think I’ve picked up a stainless steel skillet in years, to be quite honest. We have a 10-inch and two 12-inch cast iron skillets and they are used every single day in our house. At some point, there is always one on the stove! They are a very inexpensive investment, and I believe every kitchen needs at least one! Graeter’s Ice Cream – If someone on your list is an ice cream junkie, consider sending some amazing ice cream straight to their doorstep. There are a lot of services and monthly clubs out there, but I’m partial to Graeters. They allow you to put together a 6-pack or 12-pack of different flavors, plus it’s my very favorite ice cream in general! Breville Smart Oven – I hadn’t ever used a toaster oven before my husband and I moved in together, and now I have no idea how I ever survived without one! We use it multiple times a day, for everything from plain old toast, to reheating leftover pizza, broiling hoagies, and everything in between. The Breville has been our workhorse for nearly five years and we LOVE it, but I was recently able to test the Wolf Gourmet Oven, and it is every bit as fantastic as you’d imagine (and gorgeous too)! KitchenAid Hand Mixer – I love my stand mixer, but I use my hand mixer wayyyyy more often than my stand mixer. Most jobs don’t require a stand mixer, and this KitchenAid hand mixer makes easy work of virtually any cookie dough or cake batter. Thermapen – This instant-read digital thermometer has been a staple in my kitchen for years… I couldn’t imagine cooking or baking without it! I use it for taking the temperature of everything from whole chickens, deep-fried turkeys, caramel sauce, candy, baked bread, burgers on the grill, and everything in between. While it’s on the pricey side, it’s one of the best kitchen investments you’ll ever make! Spiralizer – If you’re a veggie lover (or maybe trying to get kids to eat more of them! ), then a spiralizer is a must-have in your kitchen. The vast amount of different things you make with this is amazing (I’m partial to curly fries, naturally, ha!). Air Fryer – I don’t have an air fryer yet, but everyone I know who has one LOVES it. Do you have one? Tell me about it! I have this one saved in my cart, but haven’t pulled the trigger yet! Swiss Diamond Nonstick Frying Pan – This is the first nonstick pan I’ve bought in… maybe ever? It’s a dream for eggs and stir fry without needing to use much in the way of fat. I was pleasantly surprised with how well it browned stir fry, actually. If you’re in the market for a nonstick pan and want to invest in a good one, I highly recommend! KitchenAid Stand Mixer – The ultimate kitchen essential for anyone who loves to bake, the Kitchen Aid stand mixer is a classic, timeless addition to your kitchen. Wolf Gourmet Electric Griddle – I replaced an old griddle whose finish was chipping off with this one earlier this year and my pancake game has never been stronger, ha! Seriously, this makes amazing pancakes, and it’s great for griddled sandwiches like reubens, too. Love, love, love it. Silicone Baking Mats – I used to fly through parchment paper, and I finally broke down and bought a Silpat to fit each of my four half sheet pans, one for my jelly roll pan, and one for my quarter sheet pan. I absolutely adore the way everything bakes up on them. Laguiole Jean Dubost Stainless-Steel Steak Knives – We bought these back in December to replace the old steak knives we had. We had a mix of a couple of sets, half of them couldn’t go in the dishwasher, wood-handled ones always smelled kind of musty… so I went Googling and researching and this French brand came up time and again as the best of the best. I found this stainless steel set at Williams-Sonoma that are dishwasher safe and slice like a DREAM. Highly recommend if you’re in the market for knives (or know anyone getting married!). David’s Tea – I actually don’t drink tea, but my mom loves it, and I bought her a gift set from David’s Tea well over five years ago now and she totally fell in love with it. I now gift her new flavors each year! OXO Kitchen Scale – I am such a proponent of weighing ingredients when you bake, so a kitchen scale is an absolute must in my book, and this is the one I use in my kitchen. It can hold up to 22 pounds, so it’s incredibly versatile. Wolf Gourmet Blender – My all-time favorite blender! I’ve used a budget-friendly KitchenAid as well as a Vitamix, and this Wolf Gourmet blender was the best in my book. Nothing gets stuck in the bottom and it makes super quick work of smoothie ingredients, frozen fruit, etc. Instant Pot – One of my new year resolutions for 2019 is going to be to make better use of my Instant Pot! I love the convenience and versatility with everything you can make in it. Le Creuset Dutch Oven – This is a pricy investment, but absolutely worth every penny. I have had the 7.25-quart version for nearly 10 years and I use it multiple times a week… spaghetti sauce, soups, stews, chili, braising, no-knead bread… you name it and you can make it in a quality Dutch oven! Scrub Daddy – My aunt turned me on to these a couple of years ago, and I’ve admittedly never been a sponge person, but they’ve converted me and I’ve used them ever since. You need very little soap, they rinse super clean and dry quickly. I love these! Wusthof 7-Piece Knife Set – Good knives are one of my top three kitchen essentials, and perhaps THE biggest difference-maker in your cooking or baking prep. There are so many different brands, but Wusthof is my absolute favorite and this set contains all of the basics. Breville Sous Chef Food Processor – I’ve owned this food processor for over five years, and while it’s definitely an investment, I’ve yet to use a better food processor. It is an absolute dream, and I love that it has a digital counter so you can easily see how long it’s been running (perfect for recipes that indicate a specific processing time). All-Clad Slow Cooker – I have two friends who own this slow cooker and give it five massive stars. It holds an enormous amount of food, you can sear meat in it (no dirtying extra pans! ), and it cooks perfectly and evenly. It’s on my own wish list! TELL ME! What would you add to this list? I’m always looking for new ideas! The Wolf Gourmet Oven indicates it is no longer available when clicking on the link. I was really excited for this list till I saw the prices. Yikes! Any suggestions for people that cook and bake but are living on a real-world budget? Hi Kristen, What exactly are you looking for? 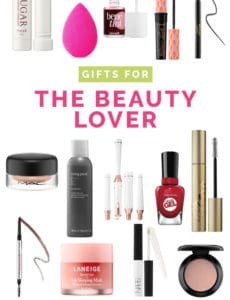 I’d be happy to give you my recommendations if you tell me what type of product you’re looking for and at what price point. However, the sheet pans, cast iron skillets, baking stone, silpats, spiralizer, kitchen scale, tea, and sponges are all what I would consider “budget friendly”. I like to include items at a range of price points, and those that I’ve also had personal experience using. I love my sheet pans and uses them all of the time. I’m ordering some silpats to go with them. What is the advantage of a jelly roll pan? Can’t they be used interchangeably with the sheet pans? Hi Susan, A jelly roll pan is just a different size; the half sheet pans are usually 13×18 while a jelly roll pan is 10×15. Hope that helps! If just using for roasting then they can be used interchangeably, but if using for baking something, the sizes aren’t interchangeable. I tend to buy more bake goods and candy at Graeter’s instead of ice cream. There Buckeyes are so good. They have gift boxes and I give one along with a gift certificate for a later visit. Thx for the list! I have been looking for a good steak knife set. Every set I buy is disappointing, so I’ll definitely give the ones you mentioned a try! I have a set of steak knives from Chicago Cutlery that I bought at the grocery sometime in the last 6-8 years. They’re the best I’ve ever owned. I’d love to have the toaster oven, but I have no room for it. I need new half sheet pans. Ditto regarding the list! We have the All-Clad Slow Cooker and it’s amazing. Just made Italian Beef for Halloween night. We also have the Le Creuset Dutch oven. It’s a work horse and looks great on the stove😋. Also love love our All-Clad waffle maker. Awesome to know about the slow cooker! We use our Air Fryer quite a bit during the wintry months when we can’t grill outside. It makes the juiciest chicken and I always use it for crab cakes to avoid frying them in oil! Thanks for the tip! I still haven’t pulled the trigger, but great to know! What a great list! I have many of the items – LOVE the OXO scale & KitchenAid mixer & my spiralizer. As for the air fryer, I think it’s a single-use item that I don’t need. I oven fry occasionally but can’t see taking up precious pantry space for this appliance. One of my favorite & most used kitchen items are silicone spatulas – I have many different sizes & brands, all with wooden handles – some of them come apart (not good). The newer ones with plastic handles – molded together – look great. Maybe Santa will bring me some! Yes, I love my silicone spatulas too, I’ll make sure to include them in my next list! I have, it’s GORGEOUS! But yeah, no way can I justify that!